Learn more about managing an appliance repair business and your customers in our online business course. We’ve just added another FREE resource at Master Samurai Tech - available to anyone! You don’t have to be enrolled as a student to use this online assessment tool. 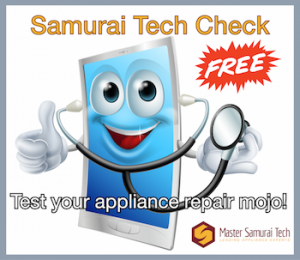 The Samurai Tech Check is a free online quiz designed to help you determine how much you (or a tech-employee) would benefit from the MST Academy's online appliance repair training course Fundamentals of Appliance Repair . The results can help to identify work readiness for a new hire, and training needs for new or existing techs. Our experience at the MST Academy is that the material taught in the Fundamentals course is a huge boost for most techs - even those with many years of experience - because the vast majority never got adequate training in Basic Electricity, circuits, and reading schematics. Even a thorough understanding of electric motors is often missing. However, some experienced techs aren’t sure if the Fundamentals course is right for them. The questions on the Tech Check are drawn from the material taught in the Fundamentals course at the Academy, so the results can give you a good indication of how useful that course would be in filling in any knowledge or skill gaps. Since we don’t teach “fluff” in the Academy, any result less than 90% indicates that there is room for filling in some knowledge and skill gaps! For new or prospective hires, with little to no appliance repair experience, you can see what, if any, foundational knowledge they bring to the table which will help shape your expectations of their training needs and how long it might take to get them up to speed. The results are reported (via email) as a percentage of correct answers in each category. See the Samurai Tech Check page for even more info and to take the test yourself! If you aren’t yet an Academy student, all you need is a free student account, which you can get at the Enroll page here at the site. 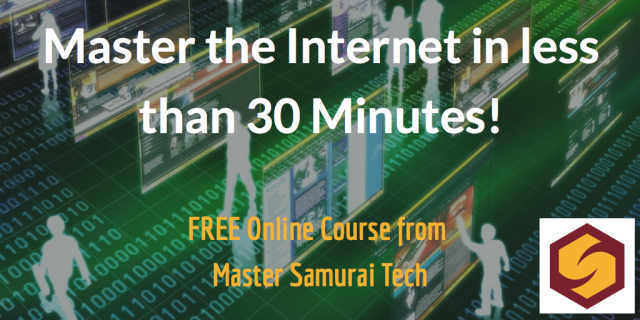 Gain Internet Competence in 30 Minutes or less… Free! Younger people have practically grown up online, yet often are missing a few important concepts on how to use the internet as a professional tool. We’ve kept it brief, light, and fun so you can whip through it in a short amount of time, absorbing whatever information is helpful for you. To take Internetology, all you need is a free registration at Master Samurai Tech which you can get here. If you already have a student account, just make sure you are logged in and you’ll see it in your course listings on your login/welcome page. If you’d like to keep up with all of our action-packed, life-altering, rock 'em sock 'em nuggets of appliance repair wisdom, make sure you are on our regular Master Samurai Tech Newsletter mailing list! Click here to subscribe for free.